Beef is the best natured bull I’ve ever seen. He’s friendly and curious, and he’s super easy to move between pastures and work with so far (I say so far because I’ve seen enough YouTube videos to know that when a bull goes bad, it usually happens fast, and there might not be a lot of warning signs; of course I’ve also seen enough YouTube videos that I sometimes wonder if what I’m hearing in the woods might be Bigfoot, so I honestly take all YouTube videos with a grain of salt and have just decided to be careful and always have an out when working with an animal that could squash me like a bug). He is not without his bad habits though. 2. He is a big pig in a cow sized suit. Seriously, I think if I left a 50 pound bag of corn open for him he would eat the entire thing in just a few minutes, and he would probably burst from the inside out before he would stop eating. Sometimes he is so picky that he tries to push Bessie out of the way so he can gorge himself on the entire bowl. We have to watch that carefully since she is going to have her calf soon. We have to make sure that he allows the calf to eat once the calf start eating solid food. 3. His worst habit though is the one that absolutely drives Ted bonkers! When he gets bored, he dumps his 80 gallon water container. Ted has tried lots of different things to keep him from doing this. Currently the water trough is half in and half out of the fence, and our picnic table is shoved up against it on one end to make it harder to tip. 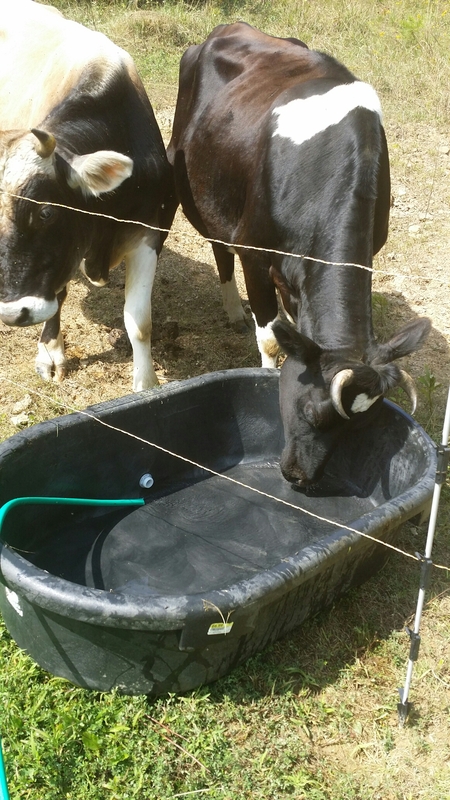 Beef has taken that as a challenge, and he spends lots of time everyday rubbing all over the end of the trough until he catches the tiny little piece of lip on it with his horns and then he rocks it back and forth until he flashes all of the water out. He may not be able to flip it upside down on top of the fence with it went against the picnic table, but he can still dunk the water. Then his favorite thing to do is just stand and wait and bellow for Ted to come back to fill it up so he can have more fun with it again.